3. Which telescope is best for solar? 4. What are hydrogen alpha and calcium filters? How do we look at the Sun with a telescope without harming our eyesight? 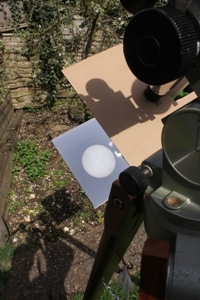 We can use solar filters (more on this later) but for the beginner the safest and simplest way is to use the “projection” method. Be aware that some telescopes have internal plastic parts and these can be damaged by heat by projecting the Sun’s image through them. The projection method uses a telescope to project the image of the Sun onto white paper or card and we look at the projected image of the Sun instead of looking at the Sun directly. The amount of energy coming from the Sun is considerable but projection allows us to observe the Sun safely. The first thing that you need to do is make either a projection screen, or box, to hold a white surface behind the eyepiece of the telescope. In some ways a projection box is often a better choice, as it will darken the projection screen and increase contrast, making it easier to see detail on the projected solar image. The screen is best attached to telescope so it will remain behind the eyepiece as you move the telescope. Normally, you can attach the projection box or screen directly to the eyepiece but some prefer to attach it directly to the mounting. The projection screen must be securely attached and not able to fall off or stop the tracking of the telescope as you follow the Sun. A projection screen will often require a second screen in front of the projection screen (see image right) to cast a shadow around the eyepiece. This helps increase contrast of the projected solar image allowing you to see more on the projected image of the Sun. Once the projection screen is in place, pick a low-power eyepiece and put this in the telescope. If your telescope has a finder leave the dustcaps on it. We are ready to start. Aim the telescope in the direction of the Sun. DO NOT LOOK AT THE SUN but instead, watch the shadow of the telescope on the floor, etc. Once the shadow has become small the telescope will be pointing at the Sun, and you should see a fuzzy white disk of light on the projection screen. Now focus the telescope until the round image becomes clear. This is the projected image of the Sun, and you will likely see some sunspots somewhere on the white disk. The sunspots may be big or very small. There may be very few or many sunspots. The size and number of sunspots varies with the 11-year sunspot cycle. If you can, try to make the size of the projected image 6 inches (152mm) in diameter as this is the standard image size used widely by amateur solar observers. The image of the Sun will move slowly across the projection screen from right to left due to the rotation of the Earth. If you have an altazimuth mounting, you will have to move the telescope every two minutes or so, depending on the magnification you are using to keep the image centred on the screen. Try various eyepieces to see what happens at different magnifications. A higher magnification will make the Sun drift quicker across the screen and will make the Sun’s disk bigger meaning you won’t see all of the solar disk at once. However, you will then be able to see more detail in the sunspots themselves. Lastly, never leave a telescope unattended while it is pointing at the Sun with a projection screen or box. Be careful, if there are children present, that they don’t try to look through the eyepiece while it is pointing at the Sun. 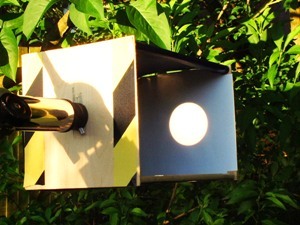 A solar projection box is another way of safely looking at the Sun. The projection box in the image here is made of balsa wood, some long wooden dowels cut to the right length (about 30cm) and some thin black or grey card. The whole lot is glued together and the card is wrapped around the outside (to act as a shade) and taped in place. The whole box is so lightweight it can be attached directly to the eyepiece. It is trapped between the eyepiece itself and the eyepiece tube (the eyepiece being held in place by the small chrome thumbscrew). This excellent solar projection box was made by former SPA Solar Section Director, John Chapman-Smith. These filters are designed to enable you to look at the Sun directly through the telescope instead of projecting the solar image. These filters are called: “white-light” solar filters because they allow all of the colours in the spectrum through (but at greatly reduced intensity). Whit-light filters are unlike “Hydrogen-alpha” filters which only allow a specific part of the spectrum to pass through them. H-alpha filters are therefore often called: “monochromatic filters”. For a white-light solar filter to be safe to use it must be capable of several things. It must block infra-red radiation (heat) emitted by the Sun, it must block ultra-violet radiation and ithas to reduce the amount of visible light to comfortable levels. It must also be made so it is possible to securely attach it to the front (or aperture) of a telescope without any risk of being displaced or falling off while in use. 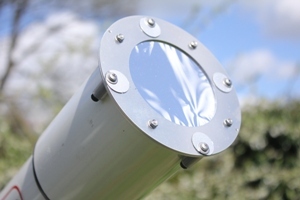 Just because something looks opaque or highly reflective does not mean it is safe to use as a solar filter. Only use a purpose-made safe solar filter that has been tested and certified as safe to use as your eyesight depends on it. Using a full aperture solar filter is a must if you have a telescope which has plastic internal parts. If you have a Maksutov/Schimdt-Cassegain or other compound telescope then only use a full aperture solar filter as solar projection will damage them. Baader Astro Safety Solar Film is about the best solar filter you can get. It is very safe and gives excellent views of sunspots. Personally, I believe it to be better than Mylar as it gives clearer, sharper, views of sunspots. It must be handled with care but is “pin-hole” resistant as it is usually coated on both sides of the film. It can be purchased in flat A4 sheets or comes pre-mounted in purpose-made filter mounts (you just need to say to the retailer what size aperture scope you have). Glass-coated Inconel type filters as these are glass-coated mounted solar filters. They tend to cost more due to the use of a reflective coating on one side of optically-flat glass. There are a number of manufacturers: Orion, for example, or probably the most well-known is: Thousand Oaks, USA. Their filters are available in three types: “Type 1” and “Type 2” are used for visual and photographic use, “Type 3” is used only for photography, never for visual use as the solar image is far too bright to be safe. These filters are robust but can still be damaged by rough-handing and can suffer pin-holes, but if you look after them, they will last a long time. Mylar is a type of aluminised plastic film. It can come in A4 flat sheets or ready-mounted. This plastic reflective film is quite tough, but the coating may deteriorate in roughly handled. The film does give a bluish tint to the solar image but this colour cast can be removed during digital processing. Always check Mylar before use to ensure there are no pin-holes or tears in the aluminium coating. If there are any, do not use it but replace the film with a new piece. The “Herschel Wedge” (or “Solar Diagonal” as it is sometimes called) allows you to observe the Sun in white-light. The Herschel Wedge can only be used with the refractor telescope (never with a reflector or catadioptric telescope). This is a piece of equipment that goes at the eyepiece-end of the telescope and looks like a normal star diagonal. The exception is that there is a piece of wedge-shaped glass inside which is un-silvered. 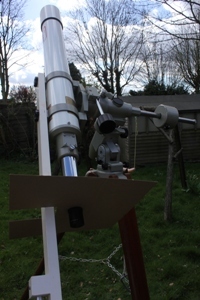 As the Sun’s image hits this glass wedge, about 95% of the solar energy (infra-red and light) is allowed to pass right through it and out the back, well away from the eyepiece. Most modern Herschel Wedges have a cover to prevent the heat from accidentally scorching your clothing! The remaining 5% of solar enery is reflected upwards towards the eyepiece by the glass wedge. The solar image is still far too bright (and there is still some infra-red there too) so a Neutral Density filter and in some a variable polarizer filter in between the glass wedge and the eyepiece to reduce the energy to a safe comfortable level. Herschel Wedges can be expensive but they can give breathtaking views of the Sun. They are not recommended for the beginner. If you do own one then please ensure you use a Herschel Wedge by following exactly the makers instructions. Next: Which telescope is best for solar?